I've been so busy trying to get my house put back together these last 2 weeks that I haven't had much time to post on here. I didn't even get around to my Insta-Friday post last week. So this Insta-Friday has 2 weeks worth of pictures. Day 14:building...Texas Children's called last Monday morning & said they had a cancellation & Addy's developmental pediatrician could see her that afternoon. Which was great news because we were still on the waiting list for an appointment & I really wanted to have her check up before school started. The kids love the big dancing pigs on the first floor. A little coloring while waiting to see the doctor. Addy had a GREAT yearly check up! Her doctor said that he thinks our decision to have Addy repeat Kindergarten is a good idea & he said that we have everything in place to help Addy be successful. Just what I wanted to hear! Addy loves the Jake boat too. Since Alex was getting his Jake boat, I let Addy pick out a toy too. She picked a FurReal puppy that barks and walks. Last Friday night, Nick went & picked up Chipolte for dinner. While he was gone, the kids & I played Candy Land. I told Nick "Our idea of a fun Friday night sure has changed!" Ain't that the truth, lol! Alex arranged all these beanie babies from some of his favorite shows. Think they have enough of these Ty babies??? The kids were playing with a Decorate a Face sticker set. Alex decided to decorate his face instead of the paper one. Day 22: upside down...The dentist called & said my mouth guard was in. So I had to go & have it adjusted to fit just right. It's a different type than my last guard & it fits so much better. It's been less than a week & I can already feel the difference in the mornings. Yay for not clinching & grinding my teeth anymore! Addy pretending to be a magician. She dressed up, put out some chairs for Nick & I to sit in & then put on a show. She made things disappear & then reappear. It was great! On Wednesday we met some friends at Lone Star Bounce. Alex rode the mechanical bull. He didn't last the whole 8 seconds. We were all hungry when we left Lone Star Bounce, so we stopped at Sonic for lunch. I let the kids get out of their seats & play in the car while we ate. Addy took my sunglasses & gave me the teenager duck face. So funny! Today we went swimming at Addy's friend's house. (He's a little boy also on the spectrum & we've been getting together throughout the summer to let the kids play.) We swam for about an hour & then Addy said "Get out, let's go home." And so we did. As you can see, we really haven't done that much over the past couple of weeks. Except for CLEAN MY HOUSE! And now that that's done, we can get back to enjoying our summer. So hopefully next week, I'll have a lot more pictures to share with you. July 5th was my 33rd birthday! Am I really that old already?? Where have those years gone? Since we were still in Beaumont for the 4th, Nick & I took the kids to Wayne & Tracey's for the afternoon. Don't you think this is a good look for me, lol! Nick jumping off the diving board. And then that evening, Nick & I met my best friend Jessica & her 'man friend' Jay at Carrabba's for dinner. Jessica surprised me with a birthday cake! I couldn't think of anything to wish for! (Crazy I know, but I have a pretty great life & get almost anything I want anytime I want.) So by the time I thought of something to wish for, the candles were almost burned out. Thanks Jess for being the best friend a girl could ask for and for making me feel so special on my birthday! (Especially since I was in such a funk about turning another year older.) I love you! It's once again Friday & of course that means it's time for Insta-Friday! Saturday, I went to my sister's house for book club. Alex loves his cousin Hannah! Alex & Boone playing the piano. Alex told me that I needed to cover my ears because they were playing really loud. While I was at my sister's, Nick painted the playroom. It was a maroonish color & really just too dark. And now it's a milk chocolatey color & looks great! Addy was obsessed with animals of the savanna this week. So I drew a background for her & she drew a mommy & baby elephant, lion & giraffe. We cut them out & taped them onto her savanna. Then she put on her 'safari' hat & sunglasses & she was all set to go to the savanna! 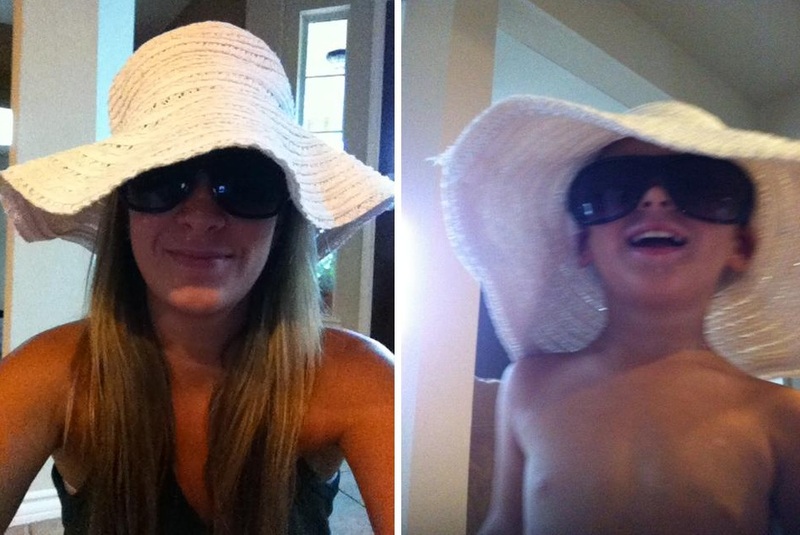 And Addy made me & Alex wear the hat & sunglasses too! 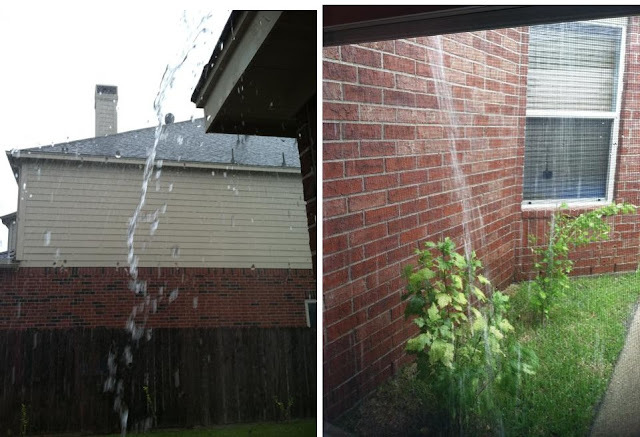 It basically rained all week long, which I loved! Day 11: My favorite color... Pink...Alex put on Addy's raincoat (he doesn't have one of his own, I guess I need to buy him one) & played in the rain. Alex loves to draw & write letters. Since we were going to have to replace the living room floor, we decided to replace the playroom & dining room at the same time so they would all match. Here's day 1 of the process. Nick laid most of the tile in the playroom after work on Wednesday. Thursday, Addy had an appointment for the dentist to look at her bottom teeth. One of her permanent teeth is about halfway in but her baby teeth haven't fallen out yet. The dentist said they may have to pull 2 of them, so I got Addy to give me a big toothy smile before we left the house. After the dentist examined them, she said that we still have a little more time. If they haven't fallen out by the time the permanent tooth is almost completely grown in, then I'll have to bring her back to have them pulled. That should be interesting! Nick's parents came over on Thursday so that Nick's dad could help him with the tile. They brought Addy a toy wildlife set, which was perfect because of her obsession with savannas this week. Alex just liked the box. And they brought Alex a spiderman glove that shoots silly string! But don't worry, I actually had a can of silly string (stashed away in a cabinet in case of a silly string emergency, which this definitely was) & so I got him too! And then a silly string war ensued! Last night Bailey didn't come inside at night like he usually does. And then this morning, he still didn't show up. And now it's Friday night & he's still missing :( Luckily, Addy's had Mawmaw to play with all day so she hasn't been asking for him. I'm going to make signs & walk around the neighborhood looking for him tomorrow. Last year when he went missing, he was stuck in a neighbor's backyard for 12 days. Hopefully we'll be able to find him tomorrow. I don't know that Addy & I can take it if he's missing for a long time again. Day 13: Open: This morning, I opened Addy's door & this is what I saw. Alex was the music conductor (he has a drum stick in his hand that he's leading the music with but it's hard to see it in this picture) and Addy & Mawmaw were singing. It was really cute! And then Addy got up, walked over to me, pushed me out of her room, said "Bye Mom" and closed the door in my face! She ovbiously doesn't need me this weekend with Mawmaw here! Pat & I took the kids to run a few errands. We had to go to Lowe's to get a few more things for the tile install. And of course, the kids had to ride the tractors while we were there. Then we ran to Walmart & on the way out the kids rode on Dumbo. And then we went to Petsmart. We just went there to look at animals. I thought this little guy was cute. Until I saw his price tag!!! $350 for a BIRD. You have got to be kidding me! On the way home, we stopped at Starbucks for an afternoon coffee. While we were in the drive thru, Alex told me to move the rearview mirror so that he could see himself & then he started making silly faces at himself! I love that silly boy! And that's what's been happening in our home this week!